This is a super late post. Let me take a break from all the beauty posts. 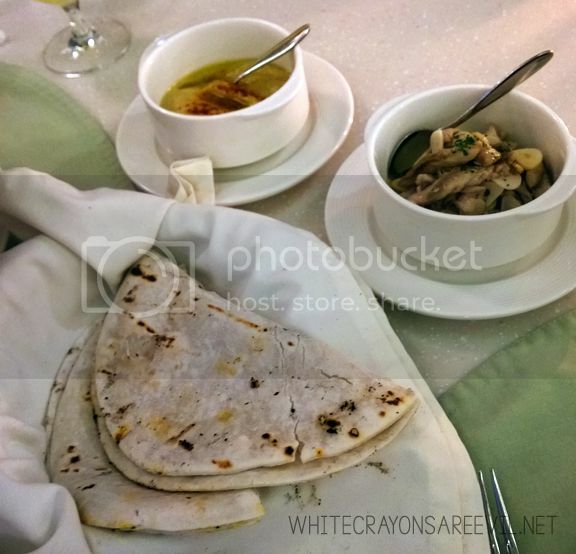 MONTHS ago, M and a lucky fellow were invited to Taal Vista Hotel in Tagaytay City for a two-night stay at the luxury hotel… (and insert more ellipses) with free food. And who’s the lucky fellow? Imagine me pointing to myself with a smug on mah fez. Since the meal was sponsored by the hotel, we didn’t know how much everything was. 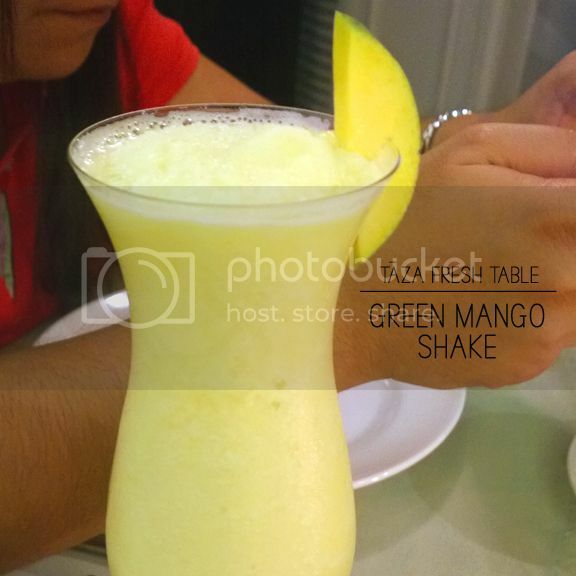 For our drinks, M settled for a green mango shake, while I listened to Miss H’s recommendation of House Blend Iced Tea. 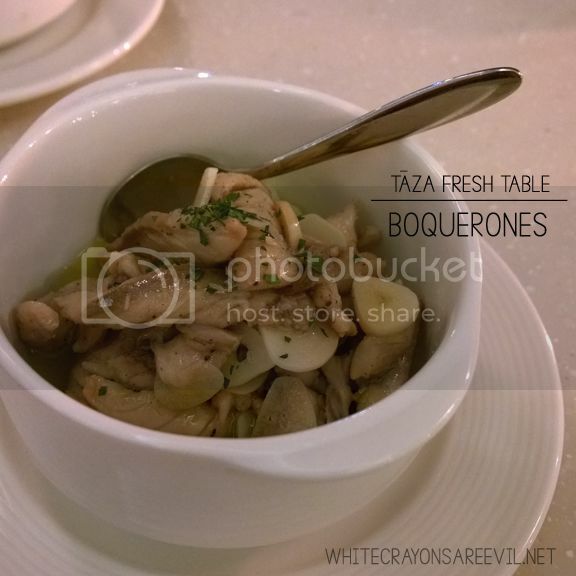 I am not ashamed to say that I finished the Boquerones with MUCH GUSTO that Miss H asked me if I wanted a second serving – which I decline because I was super shy. HAHAHAH. The hummus, too, was different from others I’ve tasted. I LOVE hummus, but this one has more personality to it. Maybe the texture’s different? I don’t know. M liked the Kale soup, and I LOVED the mushroom soup. It’s not that I did not like the Kale. 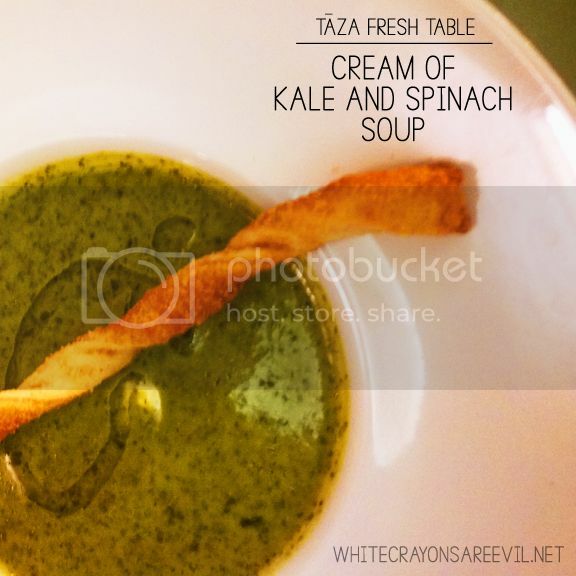 The kale soup was remarkably creamy and the taste was not really overpowering so that would made you enjoy the texture more. 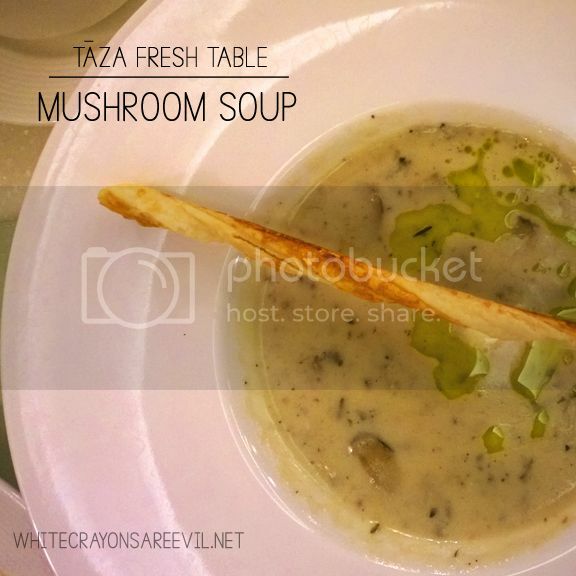 The mushroom soup. OMG. Again, very creamy, and the taste of the mushroom was not super intense, so you will not get distracted with the soup’s creaminess. So really, it’s just a matter of personal preference. I just loved mushroom more than kale. I seriously said “Oh my god” after my first bite. Ok, a huge factor of that remark was I was not expecting much magic on a salad. Salad are ‘meh’, btw. So, the first time I tasted this salad, I was caught off-guard. First, the greens were seriously pleasant and delightfully crunchy. Argh. If all the green, leafy vegetables are of this quality, more kids will eat their veggies fo sho! 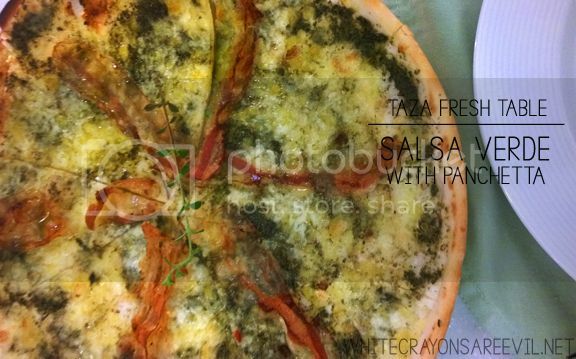 Second, the dressing was not too overpowering so it didn’t take the attention away from the freshness of the greens, yet it has its own personality that demanded attention itself. Gets? The panchetta added that little extra, that little kick. The greens, the dressing, the panchetta – the balance of flavor and texture was perfection. See, I can still remember the salad – A SALAD! – in great detail. My gahd, I love this salad. I was sooooo overwhelmed when they took out a WHOLE pizza for my and M’s tasting. 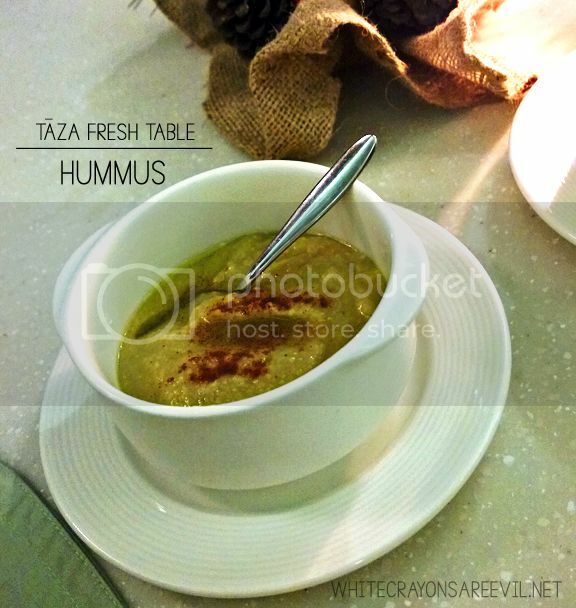 At this point of the meal, I realized that Taza’s strongest suit is their dishes’ aromas and freshness. 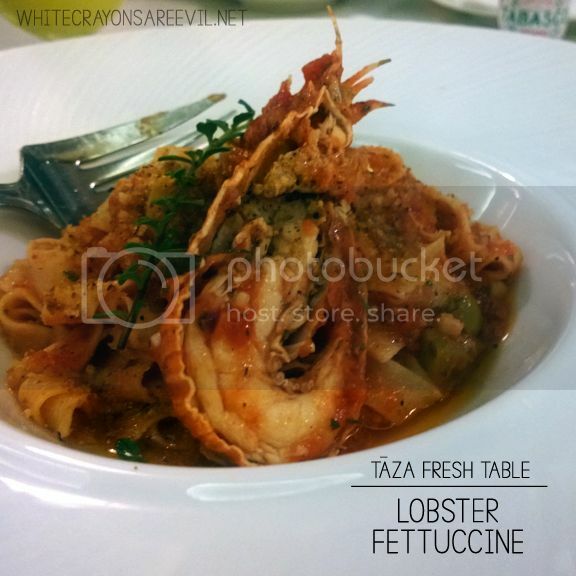 The fettuccine was no different. It’s just a fettuccine, right? What set it apart from other fettuccine was its, i dunno, smell. Maybe it’s the herbs? The freshness? The explosion of flavor? I honestly don’t know. And now, the star of the night. 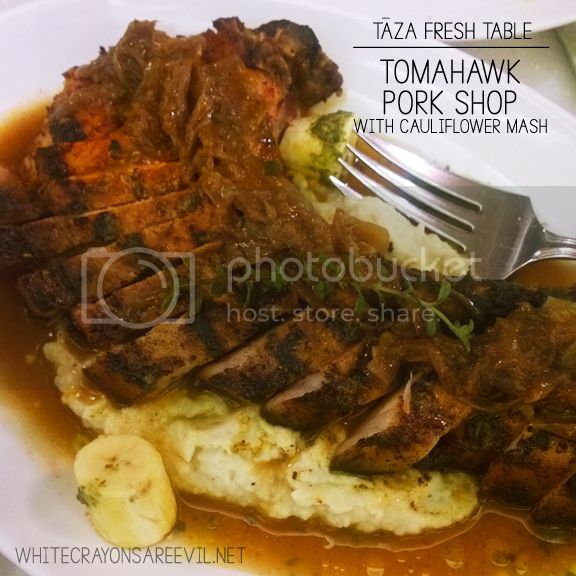 That mashed thing which served as a the bed of the mighty porkchop? That’s a freaking cauliflower. AMAZING! It was creamy and did not taste like it’s something healthy! That banana? That’s a normal-sized banana. Yes, that’s how large the porkchop actually was (the fork was the large, serving fork). The porkchop itself? Beyond splendid. 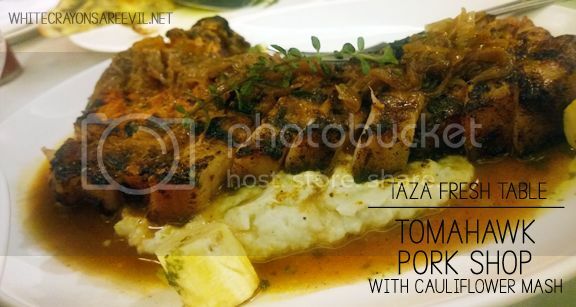 The meat itself was tender, and the flavor was the perfect balance of herbs and spices. It’s not super salty (like most porkchops I tasted), and it was very aromatic. Combine all these in a big platter = a dish that would make me go sigh just of the thought of it. Gah. 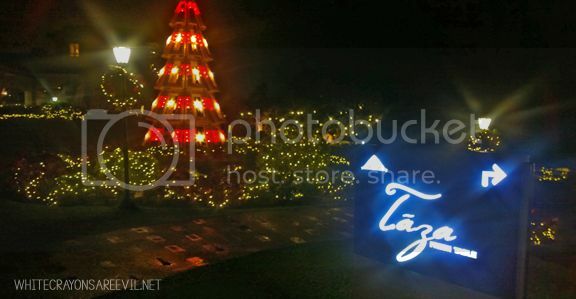 Just thinking about this bad boy makes me want to pack my bags and spend a weekend at Taal Vista. And now, for the dessert. The olive oil ice cream and the quezo de bola ice cream were unique experiences. 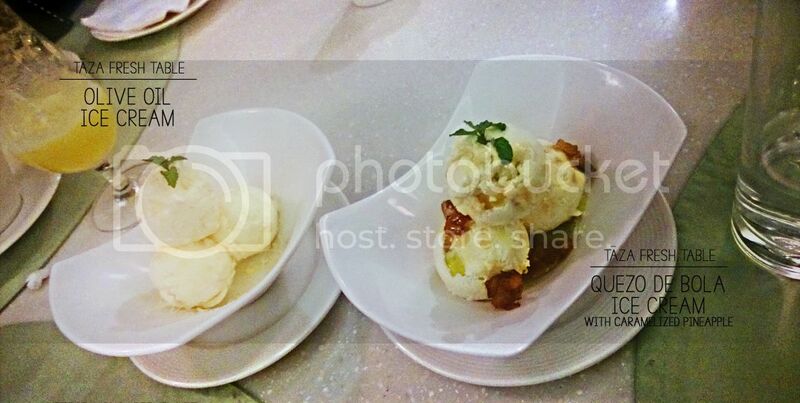 The olive oil ice cream was creamy, but it’s not something I would reach out for between the two. I can’t remember tasting the olive oil, but I remember how unique the taste was. A pinch of salt will make this a wonderful experience. The quezo de bola ice cream was, like, cheesy (it IS quezo de bola), but the ‘cheesy’ flavor is not overpowering. Yes, pretty, right? It’s like, “do we have to eat it? It looks soooo pretty”. The taste was better than it looked. I know, right? This is PB&J turned into a fancy dessert. It was simple, yet we were like “yes. this IS the perfect way to end this already perfect dinner”. 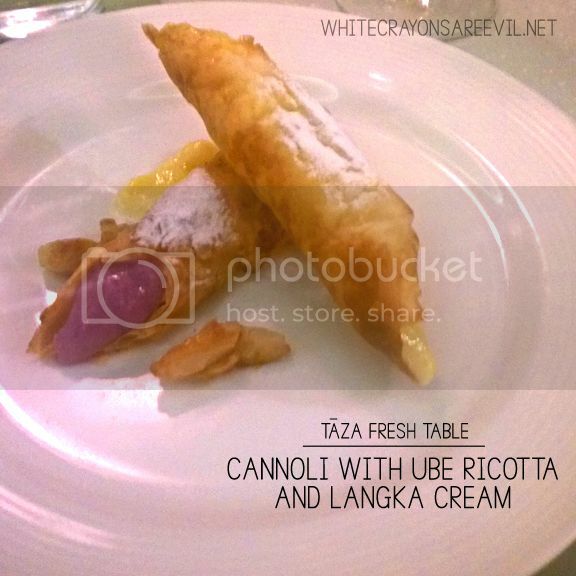 I specially love the creamy-ish texture of the fillings. No dish was mediocre. You know how when you dine out to a new restaurant and you try to sample as much food as you can and some food are ok and some are meh and some are super wow? It’s like there’s no ‘ok’ or ‘meh’, just super wow. 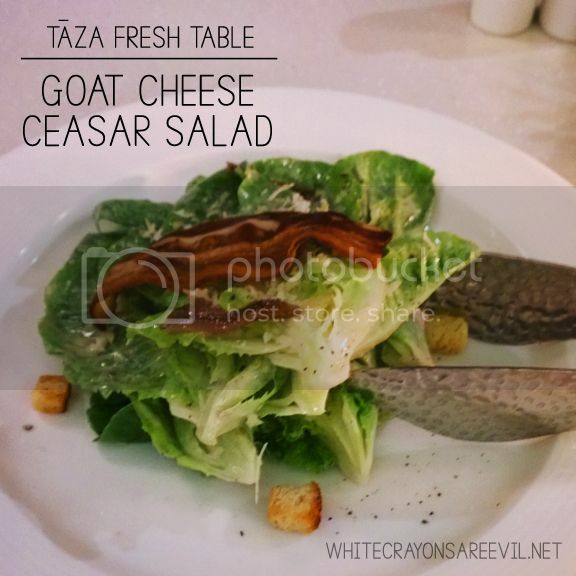 I can see why they titled Taza “Fresh Table”. How very fitting. This is hours away from where I live. I want me some porkchoooop! NOW!!!! Dinner dates. 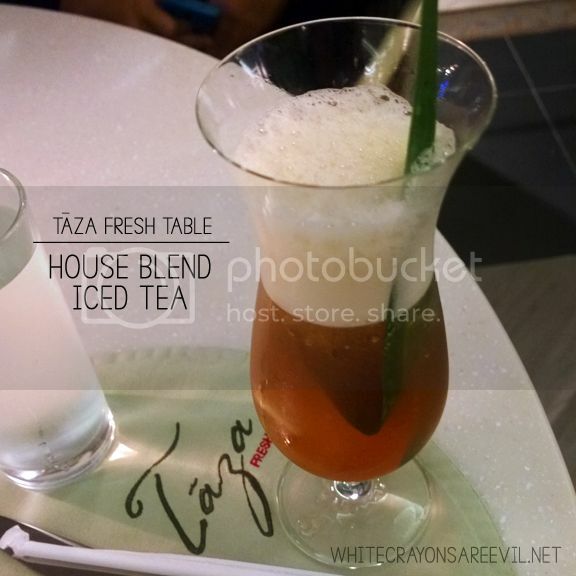 Tāza is more intimate than Cafe Verde. As I’ve stated in the earlier part of this review, our meals and our accommodation were sponsored by the hotel. M wrote about it, but I was not expected to write about it. But I am anyway. 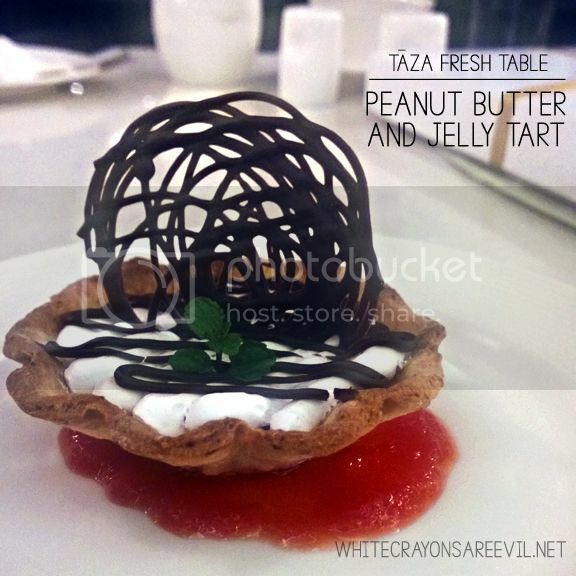 Because Taza is awesome.